Earlier this week, Toyota announced an intriguing new competition for two fans of Toyota Racing to join the team at Le Mans this year. They're looking for candidates who are enthusiastic and passionate about Toyota Racing and the revolutionary TS030 HYBRID prototype race car. Both criteria are not hard since the team showed up at Le Mans last year and really made an impression then went on to win three races in the FIA World Endurance Championship. 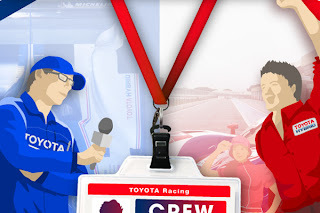 Check out Toyota Europe Blog for more information.